Party in the Pirate101 Test Realm tomorrow (Thursday Feb 23rd at 4:00pm US Central). It's not a update, though new hardware configurations need stress testing. Pirate101 swing open the doors tomorrow , and One Eyed Jack will be dropping turrets in the Skull Island Skyway of the test realm at 4:00pm . . . there will also be a limited time code broadcast while in the test realm that will only be good for an hour or two . . . Hey we may even do some Pet Sparring and take a few pictures! 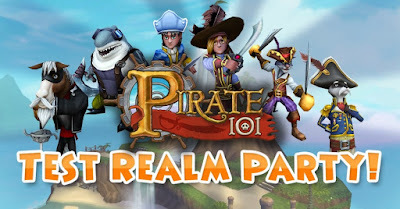 So come join in the fun in test realm tomorrow for a Pirate101 pARRrty! See you then!